The Fire Department responded to over 13,600 emergency runs in 2018 and in most emergency situations, officers will arrive at an emergency scene in just over three minutes. Approximately 20% of the total runs the FD responds to are fire related with 80% EMS related. In the case of a major fire, The Westland Fire Department is a member of an area wide mutual aid association comprised of fire departments which can provide up to 250 fully equipped Fire Fighters in less than an hour. Additionally, the Westland Fire Department is a member of a mutual aid hazardous materials consortium of communities call the Western Wayne County Hazardous Materials Response Team. 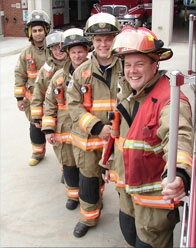 This specialized team is technologically trained to respond to hazardous materials incidents. The Westland Fire Department has currently agreed to participate in a Central Western Wayne Fire Automatic Aid Program. This program will enhance our current Western Wayne County agreement by effectively sharing resources to make available more firefighters on the scene of a structure fire in the participating communities of Wayne, Westland, Garden City and Inkster. The fire department will respond using the following procedure. Upon receipt of a reported structure fire in any participating community, the affected community's dispatch center will automatically and immediately notify the other three fire departments, who will dispatch at least one engine or rescue unit staffed by at least two firefighters. Westland Fire Fighters are Fire Fighter I and II level train through the Michigan State Police, Hazardous Materials Operation Level Certified, Cold Water Rescue, annually trained through the Michigan Municipal League Driver’s Training Emergency Response Vehicles. The department also conducts on-going viable training for its all fire department members so that basic skills and techniques stay sharp and developed. Paramedics make up the highest level of pre-hospital care providers. These practitioners extend some of the most crucial capabilities of the hospital emergency department to the field. Paramedics are proficient in monitoring heart rhythms, delivering precise electrical therapy (defibrillation) to patients suffering certain abnormal rhythms, preparing and administering a number of emergency medications and providing more advanced respiratory support. A paramedic's level of expertise in assessing patients is significantly enhanced and a direct radio link to the receiving hospital emergency department provides an opportunity for consultation and direction from emergency medicine physicians. This Service definitely provides a higher quality of life for all communities!